Red/Green/White fused Dichroic glass Silver heart shaped broochAbstract design dark Purple fused Dichroic glass brooch. 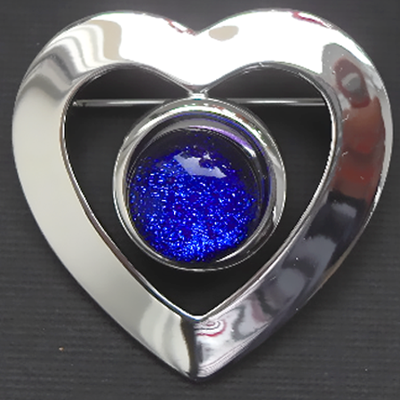 It measures 3cm x 3.5cm and is made of very good quality plated silver. The glass piece measures 1.5cm and is made of two layers of glass. A layer of Cobalt Blue dichroic glass, then a layer of clear glass. There ia a matching bracelet. It has a strong brooch pin and comes in a Black or Silver card giftbox.